Different slice of life series will prioritize entirely different things in order to be successful. Some will lean heavily on tone and atmosphere, staking themselves on a singular feeling or a sole emotion that permeates every inch of their experience. Others will opt to delve heavily into the minds and characters of their casts, fleshing out who these people are, what makes them tick and how they might be changing. Hyouka is decisively the latter. It is not without its scenes of strong atmosphere, its moments of strong emotion, but the thing I think everyone remembers most about Hyouka is the characters. Hyouka is a story about the Koten-bu, or (depending on the translation) either the Classic Literature Club or the Classics Club. Spurned by a letter sent from his older sister, high school student Oreki Houtarou joins the Classics Club to prevent its abolition, since it apparently no longer has any members. Contrary to his expectations however, Oreki enters the club room on the first day to find that another student has already joined: a curious girl named Chitanda Eru. With his task having completed itself on its own, and the club no longer in danger, Oreki tries to back out, but is unable to turn down Chitanda’s positive, boundless energy, as well as the playful jeers of his only friend, Fukube Satoshi, who also subsequently joins the club. Within an episode or two they are joined by one Ibara Mayaka, and our cast is complete. The standard actions of this group run counter to what one might expect from a literature club, in that they primarily solve mysteries. Well, “mysteries” might be too strong of a word. A better one, or three, would be “slightly odd situations”. Why is this book being returned to the library every week? Why did this teacher get his lesson plan wrong? Why is this door locked when it should be unlocked? The triviality of these “mysteries” might not interest the average person, but there’s one person that they interest tremendously, Chitanda, and since she’s a member of the Classics Club, they all get pulled along in the quest for answers. Chitanda’s blossoming curiosity gives the club questions, and every time, it falls to Oreki to think them through and provide answers, investigating witnesses, considering evidence and producing a hypothesis that is not only reasonable but will satisfy his inquisitive colleague. But, that’s a plot synopsis. Hyouka isn’t a plot show. Like most of KyoAni’s repertoire, it’s a character one, and a synopsis like that affords only the barest glimpses of its actual story. The show opens on an internal monologue that, while perhaps not especially subtle, sets up our main character within a minute. Oreki prides himself on being an energy-conservationist. Not in the sense that he makes sure to put out the lights when he leaves the room or turn off the water when he brushes his teeth, but that he himself expends as little energy as possible in his day-to-day activities. Oreki doesn’t want the “rose-colored” high school life that everyone else seems to; he’s perfectly happy with a “gray” existence and just wants to coast through with the bare minimum of effort and energy. His personal philosophy is to not do anything he doesn’t have to and do quickly anything that he does, which calls into question why he would even join the Classics Club in the first place. Initially, because it fell into the pool of things he “had” to do. Joining a club on paper then never showing up again in order to appease his sister and keep the club afloat falls perfectly in line with his essentialist attitude. So then, once Chitanda shows herself and it’s clear she intends to join the club, why didn’t he immediately leave? Sticking around is completely contradictory to everything he claims about his lifestyle. Well, that is the question, and the show spends its whole run developing an answer to that question. It’s easy to say simply that he couldn’t turn down a cute girl in need or felt pressured by his friend, and maybe that’s even what he thought himself, but that’s just too easy. At first, Oreki supposedly wants nothing to do with this, and even fakes a mystery to keep Chitanda entertained, but as early as episode 2, the true depth of his thoughts and actions starts to present itself. When he sees the rest of club talking and having fun amongst each other, he comments that “I can’t be like them”, framing it for the first time not as an intentional choice but as a perceived fundamental difference between him and them. Over time, as he is forced to interact with “them” more and more, and solve cases beside “them”, Oreki questions if he will have regrets about his current life ten years from now, and the fact that he isn’t able to immediately dismiss the notion troubles him. He tries to convince himself that he’s nobody special. He’s normal, and thus a normal “gray” existence suits him just fine. When he solves case after case, it’s not his powers of observation, nor his great deductive reasoning. He’s just lucky; anyone could have done it. But in spite of himself, he warms up to putting in an effort. He warms up to trying, and admitting that he is, and that maybe he’s good at it. He starts to concede that maybe he just got used to being “gray”, rather than desiring it, and that just maybe being “rose-colored” isn’t so bad after all. This character journey isn’t complicated, or even unexpected, but nowhere is it written that a great story needs to be, and the reason it works so well is that it is so very gradual and subtle. Oreki isn’t unrecognizable at the end of the show. He isn’t an outgoing “let’s throw ourselves 110% into everything we do” type of guy... but he starts to entertain the “what-if” and occasionally act on it, which might not be as a satisfying as a full-blown climax where he completely rejects his old self or something, but it fits Hyouka, a show that is never so much about the big moments as it is the little ones. Completely divorced from his growth as a character, I also found Oreki to be the show’s one consistent source of humor. He’s snarky (mentally) in a way that half-reminds me of Haruhi Suzumiya’s Kyon, and his low-effort mindset makes for these great running gags. Often when Chitanda leaves the clubroom, expecting him to follow, he just lounges in the chair and she has to drag him along, or, say, when Ibara snidely tells him to go home, he’ll try to take her up on it and leave. A lot of it’s funny because it’s so low-key; he’s not one to make a fuss out of anything, he just quietly tries to live his life as he wants, and the others are left to react. Now it’s great that Oreki goes through that personal journey, but there’s another side to the same coin: his friendship with Chitanda. Chitanda is pretty obviously a representation of the “rose-colored” life that Oreki desperately wants to avoid, which they couldn’t spell out harder if they tried, considering the fact that she literally has a rose-colored aura when she gets excited. Before talking about her character, I must say I really like Chitanda’s design; she has this full head of hair that almost gives the impression of a fleety small animal, which fits her inquisitive nature. Chitanda right away might come off as the stock airheaded moe girl, but it’s made immediately clear that she is more than that, at least superficially. She has a startlingly good memory, oddly acute senses and apparently a very strong reason for joining the club, something she’s reluctant to talk about and goes a little deeper than “gee, this sounded fun”. She’s good at school, she tries to make jokes, she has opinions on philosophy, her personality just has these details that make her feel more like a real person than a character of her archetype would be. That said, she doesn’t completely break the mold. She’s quite gullible, and a little naive. She almost always cuts straight to the point, not being much of a charismatic conversationalist (in fact finding roundabout conversation tiring), and rather lacking in assertiveness, except when she’s oblivious and unintentionally being the exact opposite. Oreki finds himself a little flustered around Chitanda’s childlike fervor and passion, with her tendency to get up close and personal like a little kid. This only worsens when he realizes he might have feelings for her, unable to stop himself from glancing at her exposed skin from time to time, which was handled with a deadpan, tasteful realism that I greatly appreciated. Chitanda is a little slower on the uptake, but near the end she too starts to get slightly embarrassed around Oreki, as their affections become mutual. It’s harder to get a bead on Satoshi, and I don’t know how much I want to give away. It’s easy to write him off early on as but the cheery wisecracking best friend, who happens to know several odd trinkets of information, but he’s probably my favorite character in the show behind Oreki himself. To put in it vague terms, Satoshi calls himself a database, and because a database can only provide information without linking it, he therefore has expectations of Oreki, expectations that Oreki can solve whichever case comes his way. That might not sound particularly interesting, but that’s really because I don’t think I can properly discuss Satoshi while remaining spoiler-free. Trust that what I just said is more meaningful than it may seem. Which brings us to Ibara, the resident short and abrasive girl of the club. Ibara is handily the weakest character of the four, in my opinion. She acts believably enough, and is given certain layers of depth, especially in her interactions with the manga club (of which she is also a member), but her scenes lacks the impact or memorability of anything that involves the rest. I’m not at all familiar with community impressions of Hyouka at large, so I don’t know if that’s a common opinion or a controversial one, but it almost felt like Ibara would have had more focus in a later novel that the anime just didn’t adapt. Maybe not, but that’s just the feel I got. At the end of the day, there’s not a lot of reasons why Hyouka is a good series. Really, in my mind, there’s only two. As I’ve just gone over, the characters are mostly awesome, that’s one. The second you’ve hopefully noticed just by watching up to this point (er, if you were watching the video version): Hyouka is absurdly f**king good-looking, which really sells everything it tries to do. When you start the show, you’d probably think “surely, it looks this good because it’s only the first scene, maybe the first episode, there’s just no way it can maintain”... but it does. It never stops. So many great, striking layouts, so many subtle, detailed movements, so many great transitions, so many cool visual asides, even tropes as tired as characters appearing in each other’s eyes. Obviously, none of the animation is action-oriented (there’s not even like a fist fight as KyoAni works have occasionally had in the past); all of the movements are natural and normal movements, like getting up from a chair or opening a door, rendered with meticulous detail just about each and every time. To be fair, I don’t think that everyone will find that appealing, which I get. There’s certainly a catharsis to big, all-out action scenes that, as well-animated as Hyouka is, it never really manages to reach. But, that’s okay. Not everything is shooting for that effect, or needs to. For the subject matter that it tackles, of a completely grounded high school life, I think Hyouka is one of the best-looking anime around. And it doesn’t even settle for always looking exactly the same. More often than not, when Oreki goes through a train of thought, or some other character has a story to tell, the show will shift into an alternative visual style, wildly varying from one to the next. A gloomy painting, a pop-up book, a colorful re-creation of an earlier scene, movie screens everywhere; the show is incredibly dynamic with its visual storytelling. If it can, it has no reason to let two characters talking be just two characters talking. It won’t go as out-there as something like the Monogatari series, but it’s leagues better than anime’s standard “let’s just cut back and forth between boring shots of these two people”. Both openings have neat visual ideas too. For the first, that’s all I would say, as in “hey, that effect’s neat”. The second opening, on the other hand, tells a very simple but kind of beautiful story. Oreki looks in from the outside at all the other students, alone and gray, none of them even glancing at him, but when he meets Chitanda, and the rest of the club, she sees him and pulls him to the other side. Great stuff. I’ve done almost nothing but sing Hyouka’s praises so far, but we’re nearing the end of the line so unfortunately that stops here. Just because Hyouka is a character show doesn’t mean I can’t criticize the plot, and I feel I must. The show has three arcs, which all revolve around some central mystery. The run time between and after these arcs is filled out by episodic stories, that begin and end within the span of an episode. The arcs are always important and very memorable, furthering a character or multiple characters in very meaningful ways. Some of the quote-unquote “side stories” do the same, especially near the end, but I had certain disappointments with how things played out. For one, the show ends on those episodic stories. It wraps up a big arc around episode 17, and rather than launching into another, it contents itself without a central narrative from that point forward. Some of the episodes in this span are very good, episode 21 in particular, but I couldn’t escape a lingering disappointment that at least a couple of these episodes added very little, and might as well have been OVAs. 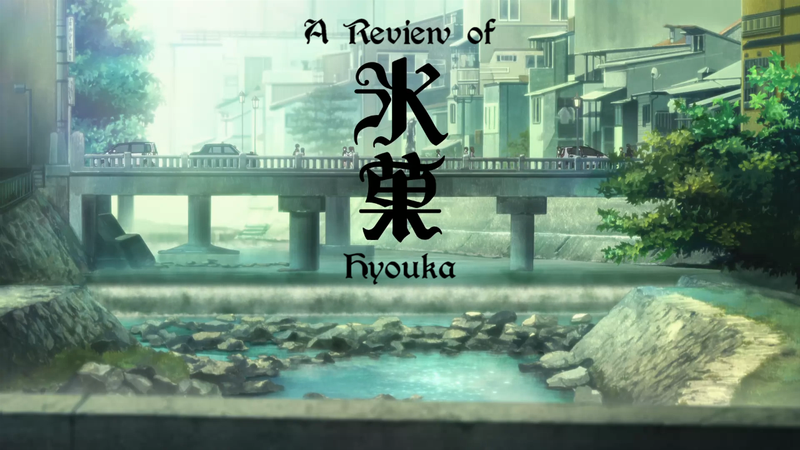 In total, between side story episodes scattered here and there, and trivial scenes slotted in at certain points in the major arcs, I would estimate that at least a fifth of Hyouka’s runtime is meaningless. Fun, but only insofar as you enjoy these characters on principle and like to see them interact, not because anything especially new was added. And that’s all I got. So, after taking everything into account, on a scale from F to S… mmm, this is a super tough one. Let me say, I’m inherently a plot guy over a character one. I instinctively enjoy things happening with flatter characters more than things not happening with fleshed-out characters. Therefore, Hyouka is a high A. If you know you enjoy character-driven slice of life, I cannot recommend it highly enough, but I would advise holding off if you need strong plot or, actually, if you’re a mystery buff and really want a mystery series, because the “mysteries” are so trivial they almost always feel more like vehicles for the characters to grow rather than compelling mysteries themselves. Unfortunately, the series is not currently available for legal streaming in full anywhere. You may watch the first half, dubbed, on Funimation (likely intended as an ad of sorts for their new Blu-rays), but if you want it in full or in Japanese, you’ll either need to buy those Blu-rays or look... elsewhere.